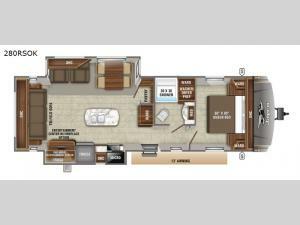 Step inside this Jayco Eagle HT 280RSOK and experience a travel trailer that will take you on your best adventure yet! Meal prep will be a breeze with the kitchen island that gives you more counter and storage space or you can enjoy the fresh air while cooking at the outdoor kitchen. You can also enjoy your meals at the free standing dinette or set up a table and chairs underneath the 13' electric awning with LED lights. The full size bathroom not only has a spacious 30"x36" shower, but is also prepped for a washer and dryer! When you're winding down the night, you can choose to either head into the front private bedroom or relax in the rear living area and watch your favorite movie.